Earlier this month some of our greatest sporting heroes thrilled the nation at the Commonwealth Games. Australians watched with pride as young people from all over the Commonwealth played together in a spirit of friendly competition. In many ways, sporting events celebrate freedom – the freedom to test yourself against your peers in a celebration of shared humanity. ANZAC Day is a time to reflect on freedom – how it was won and how it has been maintained over our nation’s history. In 2018 each of us is at liberty to pursue our lives and passions in whatever way we choose. Whether it is sport, the arts, business or any other endeavour, being Australian means you have at least the potential to do what you want and be who you want. But our freedom did not appear out of nowhere. It was won for us by generations of men and women who served our nation in war. We owe those men and women a debt of gratitude. They were ordinary people, just like the people gathered in this historic Town Hall. They had the world at their feet. They were poised to make their mark. But because of circumstances beyond their control, they were required to shelve their aspirations and risk their lives to preserve freedom – their freedom and ours. At Gallipoli, for example, there were 26,111 Australian casualties, including 8,709 deaths. Today that would be like having over 300,000 leaving our shores never to return. Just imagine all of those lives cut short. … and all of that precious human potential that was never given a chance to bloom. There will always be debates about the rights and wrongs of war. But Anzac Day is not about that. It’s about recognising the extraordinary grit and courage of generations of average Australians, many of them from our own community in Sydney’s Inner West. One of them was William Mathew Currey, who was born in Wallsend in 1895 but moved to Leichhardt for work before joining the army in October, 1916. Less than a year later William won the Victoria Cross for single-handedly attacking and defeating the crews of two field guns, which prevented them firing upon his comrades. After the war William became the first VC winner to enter the NSW Parliament as the Labor MP for Kogarah. William was one of us – just a bloke from the Inner West. So was John Bernard Mackey, known to his mates as Jack. Jack went to school just down the road at St Colomba’s at Leichhardt and Christian Brothers’ High School, Lewisham. In May of 1945, on Tarakan Island in Indonesia, Jack Mackey charged two machine gun positions, killing the Japanese soldiers firing on his mates before being shot dead as he attacked a third. Jack was awarded the Victoria Cross posthumously. John William Best was from Petersham. He died in action at Gallipoli, aged 18. Victor Stringfellow worked at the Petersham Post Office. He died in action near Polygon Wood on 27 September, 1917, aged just 17. Victor’s father, Private Charles Stringfellow, also served in the AIF and was killed in action in April 1917. And it wasn’t just men. Jean Keer Greer, known to her friends as Jenny, was also from Petersham. She was imprisoned by the Japanese for three and a half years in Sumatra. But they did extraordinary things and we are the beneficiaries. Today is also a day to recognise the extraordinary efforts of today’s members of the Australian Defence force, including those based in Australia and those who are on duty overseas. 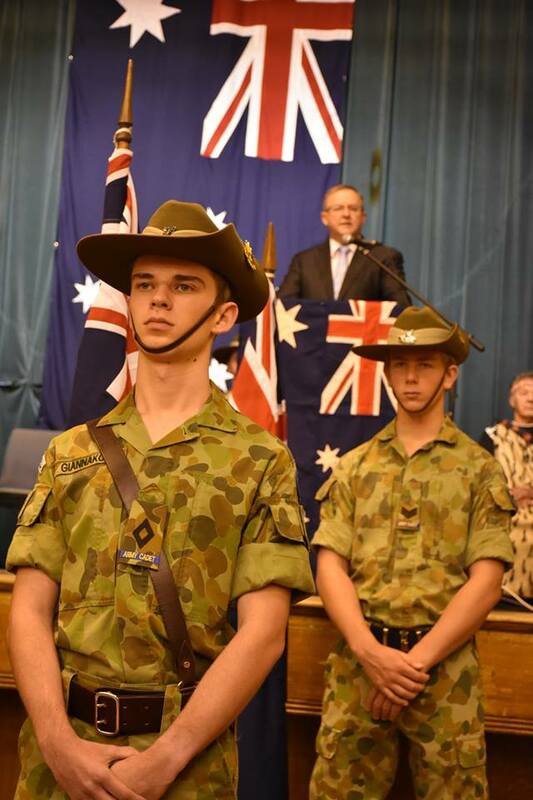 Like the men and women of previous generations, today’s young Australians can be counted on to not just enjoy the benefits of freedom, but to put their lives on the line to defend it. When I was young, it was common to meet veterans of the two world wars. You could shake their hands and hear their yarns. But back then, people wondered whether ANZAC Day would continue after all of those men and women had passed away. It has not only continued, but gained significance. Australia has been involved in many other conflicts and all service people, wherever and whenever they served, deserve and receive our recognition and our gratitude. But beyond this, Australians have a deep cultural understanding of the significance of ANZAC Day. This is partly due to the growing interest in ancestry and the ease with which people can access the service records of their forebears at places like the Australian War Memorial. But our national memory goes deeper than that. We feel in our bones that if history had taken a different turn, it might have been us having to fight for freedom instead of the Jack Mackeys and Jenny Keer Greers of this world. And as we contemplate whether we would have risen to the challenge as they did, we cannot help but be deeply moved by their selfless sacrifice. That’s why so many people attend ANZAC Day commemorations. It’s why schools teach the history and why parents make sure to pass down their stories through the generations. It’s why people buy Legacy Badges and bow their heads when they hear The Ode. So today, let’s count our blessings and remember where they came from. And once again resolve that we will never forget.